Our range of products include desiccant bag and super dry container desiccant. 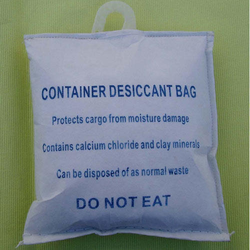 We are among the top-notch firms of the market, indulge in manufacture & supply Desiccant Bag. These bags are widely demanded by the customers across the globe for safely keeping the goods like rice, wheat and . Moreover, we stringently check all the bags on various parameters to assure zero defects. 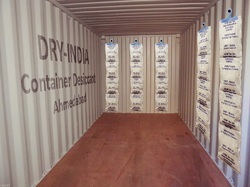 We are leading supplier Super Dry Container Desiccant. Normally the acurrate calculation for requirement of the Desiccant is difficult, because of the various factors like climatic conditions, hygroscopicity of stuffing goods, Transit duration, climatic and temperature variations while sailing in sea etc. But normally we recommend 2 - 4 kgs for a 20 foot Container Dry Cargo with Moisture content of the goods less than 10% and transit time 20 Days. If moisture content is more than 10 % we recommend 6- 10 kgs. You can also increase or decrease of the quantity of desiccants as per your needs. Using more number of desiccants will give a good protection from condensation.